Are you a sun goddess? Did you ever suffer from acne as a teenager? Do you have any unwanted skin blemishes? Does your skin look older than you are? Forever Trim has a therapy that might just be for you!! Intense pulsed light (IPL) is new technology created to help us achieve our goals of looking and feeling younger by clearing our skin of those unsightly imperfections. As we age and have had years of sun exposure, our skin becomes damaged and develops pigmented lesions (sun spots), vascular lesions (red & blue vessels on the face), and rosacea (inflammation of the cheeks and face). Fortunately, skin rejuvenation has advanced beyond the painful procedures of the past. 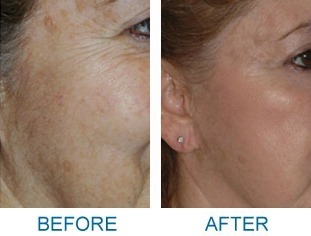 The IPL Laser provides the most skin-safe, comfortable, and effective photo rejuvenation treatments available, without any downtime. Treatments are quick typically 30 minutes, and you can return to work or other activities looking and feeling fine. Treatment protocol is 3 to 5 treatments every 3 to 4 weeks. IPL treatments involve the use of light energy to stimulate the production of collagen, the protein that gives your skin its elasticity. This technology is not only for facial rejuvenation, but can also be applied to arms, chest, hands, feet and other areas of the body where discolored skin is a visual concern. Why is Photo-rejuvenation right for you?